Textile decoration is an ancient art. 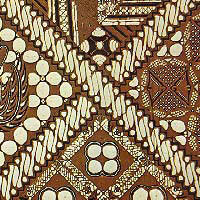 It refers to the various processes by which fabrics are printed in colored design print fabrics. Examples of Greek fabrics from the 4th century B.C. have been found. India exported block prints to the Mediterranean region in the 5th century B.C. The different ways of decorating a fabric includes dyeing, printing, embroidery etc. The discovery of a dyed cotton fabric dating back to the Indus Valley civilization shows that the art of dyeing with the use of mordents was well known to the Indian dyers 5,000 years ago. This form of dyeing was responsible for making India famous all over the world for its dyed and printed fabrics. The other forms of textile printing are stencil work, highly developed by Japanese artists, and block printing. In the latter method a block of wood, copper, or other material bearing a design in intaglio with the dye paste applied to the surface is pressed on the fabric and struck with a mallet. A separate block is used for each color, and pitch pins at the corners guide the placing of the blocks to assure accurate repeating of the pattern. In cylinder or roller printing, developed in 1785, the fabric is carried on a rotating central cylinder and pressed by a series of rollers each bearing one color. The design is engraved on the copper rollers by hand or machine pressure or etched by pantograph or photoengraving methods; the color paste is applied to the rollers through feed rollers rotating in a color box, the color being scraped off the smooth portion of the rollers with knives. More recent printing processes include screen-printing. This is a hand method especially suitable for large patterns with soft outlines, in which screens, one for each color, are placed on the fabric. Then, the color paste is pressed through a wooden squeegee. Spray printing, in which a spray gun forces the color through a screen; and electro coating, used to apply a patterned pile are the other latest printing processes. In certain cases, the cloth is painted by using a pen with dyes and mordants. This method is known as kalamkari, a pen work. Printing the outline of the design and filling in the details with a kalam, a pen, combines the techniques of printing and kalamkari. Direct printing is practised all over India where a bleached cotton or silk fabric is printed with the help of carved wooden blocks. Another technique employed was printing with the use of mordants. Mordants are chemicals that absorb the dye. The cloth is first printed with mordants and then immersed in a dye bath. Only the sections that have absorbed the mordant absorb the dye. The cloth is then washed in flowing water and spread out to dry on the riverbank allowing the sun to develop the color. Then the untreated sections were bleached with local ingredients like goat droppings, etc. Recently, discharge printing with the use of chemicals has been developed. Here dyes when printed react on one another, either bleaching the background material or producing a different shade.